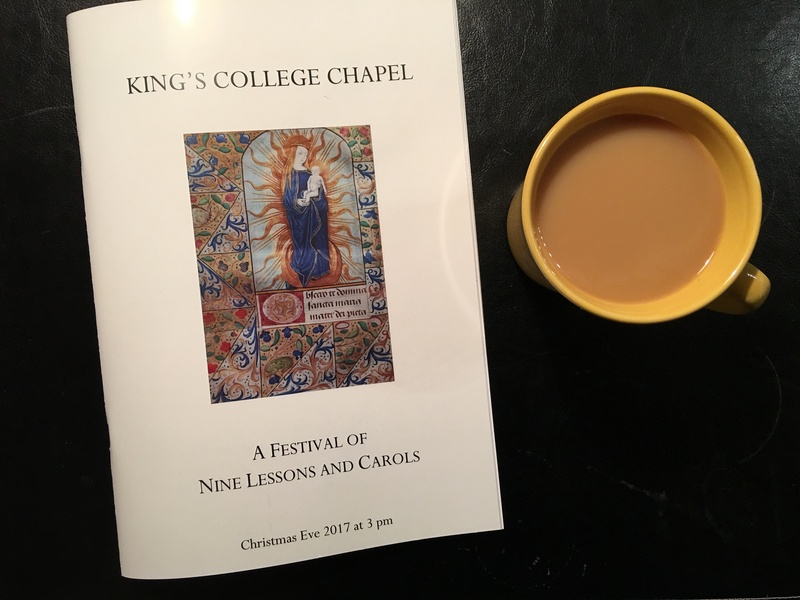 One of the traditions I’ve observed consistently over the years is listening to the Festival of Nine Lessons and Carols from King’s College, Cambridge on Christmas Eve. The 3:00 pm start time in England translates to 7:00 am Pacific time, which may be the reason I’ve been able to be so consistent with it over the years. One of the perks of owning a print shop is you can make your own program. Among the reasons I tune in each year is that it’s done so well. So much of the music of the Church around Christmas time is sad. It’s un-singable because the keys are not amenable to congregational singing or it’s so poorly put together that it’s hard to sing or it’s so loud you don’t feel any sort of need to sing (or may not want to be in the room to protect your hearing). And so the Festival of Nine Lessons and Carols is a respite. It’s an acoustic phenomenon and I look forward to it each year. Coming on the eve of Christmas, it’s a chance finally to engage musically with Christmas with nothing in the way. 1. I am not familiar enough with choral music utilizing boy sopranos, but I am impressed with the way Dr. Stephen Cleobury can get children to sing so excellently. 2. I’m stunned every year by the outright religious nature of this program. The Christian faith is intertwined with the government of England and there doesn’t seem to be a problem. Here in the U.S. I know many people for whom separation of church and state serves to protect people from the church and not the other way around. For them the Church is the institution people need protection from. I can’t imagine NPR carrying a service like this. The closest thing I can remember was the memorial service in Washington National Cathedral following 9/11. 3. While the nine Biblical texts are the same each year and while the program always opens with “Once in Royal David’s City” and concludes with “O Come All Ye Faithful” and “Hark, the Herald Angels Sing,” the genius of this service is how different it feels each year. My knowledge of choral music in the Church of England, especially music utilizing boy sopranos, is quite limited, but it seems to me that subtle emphases can make each year feel very different. This year there appeared to be a theme of honoring previous directors of music by including their arrangements. As usual, for the most part I enjoyed the remarkable diction of the various speakers. Why is it that people with an accent always sound so much more intelligent? As far as the spoken word, this year wasn’t perfect. As the Dean led us through the “Our Father,” he forgot to stop and added a “For thine is the kingdom,” before he caught himself. And one of the speakers, “a representative of the City of Cambridge,” stumbled a bit. But he read in highly accented English, leading me to believe English was not his first language (Spanish?). These momentary glitches were completely human and didn’t take anything away from anything. Third verse: a baritone soloist. The tune is magical and the variation between verses is lovely counterpoint. Of course, this song introduces the problem with Christmas traditions, which is that they aren’t always quite true to the actual event of Christmas, the incarnation of God into our world as a baby. 1. While this version of “In the Bleak Midwinter,” is among my favorite carols, the problem is that snow really doesn’t fit into the Christmas narrative. Jesus most likely wasn’t born on December 25 or anytime in the winter. (For my part, I say that December 25 is the day we celebrate the birth of Jesus not that Jesus was born on December 25.) We have a Northern-European view of Christmas, but even if Jesus was born on December 25, in Palestine it doesn’t seem likely that we’ll find “snow upon snow, snow upon snow.” And if we did, would shepherds be out in the fields keeping watch over their flocks by night? While we may be “dreaming of a White Christmas,” the first one wasn’t. 3. As far as three kings, we don’t know that there were three, it’s just that they brought three gifts so it’s assumed each brought one. And for whatever reason the three kings, like nativity sets, are placed in Bethlehem on Christmas night with the shepherds. 4. Finally, I don’t understand “I Saw Three Ships.” Don’t know what’s going on in that song, though it has a wonderful lilt to it. For whatever reason, I’m able to set all this aside and simply enjoy the readings and the music. It’s an especially metaphor-rich environment. There’s usually a reference to Christ as an apple tree, which I didn’t hear this year. Instead it was “A Spotless Rose,” which followed the reading from Isaiah 11. I guess it’s assumed that the the branch that grows out from the stem of Jesse is a rose bush. “Little Lamb, who made thee?” with music by J. Tavener I didn’t like the first time I heard it. But I’ve heard it a number of times over the years and it has grown on me. The poetry by William Blake was one of my favorites from my British Literature class in college. In spite of the tension I feel between the actual event Christmas intends to celebrate and the extra-Biblical ideas which cloud that event, I remain grateful for traditions like this. An on demand rebroadcast appears to be available here.